Tristan Tzara, born born Samuel or Samy Rosenstock to a Romanian Jewish family, grew up speaking Yiddish at home. At age 11, he was sent to boarding school in Bucharest. It is believed that he completed his secondary education at a state high school. In 1912, when Tzara was 16, he joined his friends Vinea and Marcel Janco in editing a literary and arts magazine called Simbolul. They managed to attract contributions from many established writers and illustrators. The magazine lasted only until a few months, but it played a role in introducing modernism to Romanian literature. Tzara studied at the University of Bucharest, but did not graduate. In 1915, he went to Zürich, the home of the new Dada movement. Tzara began writing in French, singing his name Tristan, and producing some of the earliest Dada texts, La Premiére Aventure cèleste de Monsieur Antipyrine (The First Heavenly Adventure of Mr. Antipyrine, 1916)) and Vingt-cinq poémes (Twenty-Five Poems, 1918) as well as the movement's Sept manifestes Dada (Seven Dada Manifestos, 1924). Moving on to Paris in 1919, he joined André Breton, Philippe Soupault, and Claude Rivière in editing Littérature magazine. He became involved in a number of artistic experiments with Breton, Soupault, Louis Aragon, Paul Éluard, Francis Picabia and others, designed to shock the public and change the structures of language. In 1925, he married Greta Knutson, a Swedish artist and poet, with whom he had a son. Around 1930, weary of the nihilism and destruction of Dadaism, Tzara became part of the more constructive Surrealist movement. During this period he wrote his celebrated utopian poem L'Homme approximatif (The Approximate Man, 1931). 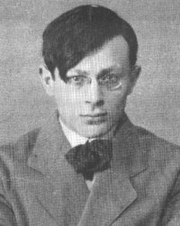 Tzara joined the Communist Party in 1936 to oppose the rise of fascism. During World War II, he served as a member of the French Resistance. He later was elected to a term in the French National Assembly. Tzara gradually matured into a lyrical poet, with works such as Parler seul (Speaking Alone, 1950) and La Face intèrieure (The Inner Face). Tristan Tzara is considered to have influenced many other avant-garde artists and movements from Cubism and Futurism to the Beat Generation. Tristan Tzara is currently considered a "single author." If one or more works are by a distinct, homonymous authors, go ahead and split the author. Tristan Tzara is composed of 5 names. You can examine and separate out names.